Do you need physical therapy but your insurance has run out? Or are you traveling and don’t have time to go to your physical therapist? 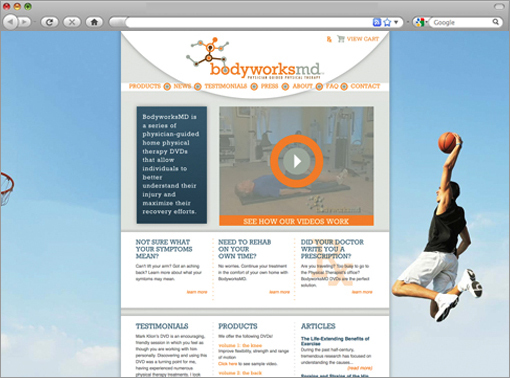 Then the BodyworksMD DVD physical therapy series is for you. With five DVDs available (The Foot and Ankle, The Back, The Shoulder, The Knee and The Hip), these at-home physical therapy sessions are perfect companions for the injured athlete. Two physicians from Manhattan Orthopedics Sports & Medical Group approached us with the idea to create this series. But that’s all they had, the idea. We created the name, the tagline and the logo as well as the DVD covers and this search-engine-friendly WordPress website. The site takes advantage of an easy back-end content management system and is updated monthly. The dynamic photos on the homepage swap out every time the site reloads so that the user rarely sees the same image. In our most recent redesign, usability was a key factor. 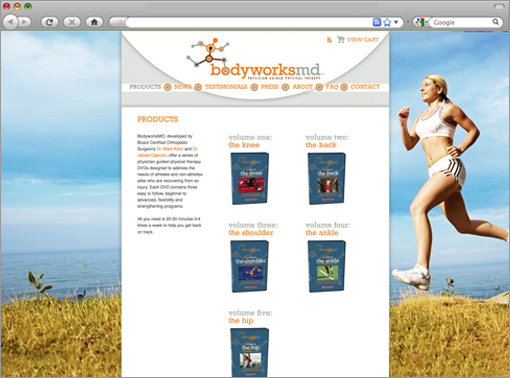 We brought the site into 2012 with fresh and bright color scheme to make it look current and modern.